Here are some examples: If you have a judgement that you are stupid and make mistakes, look for evidence to support the belief that you are smart and have made good choices. Look for evidence to support the idea that the choices you made eventually worked out for the best or that you learned something from making those choices. Write down a list of the new evidence so you can look at it whenever you need to remind yourself that you are smart. 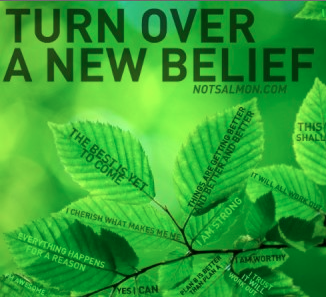 The more attention you give to the new belief, the easier it will be to release the old belief. Next begin to act with a newfound confidence, believing that you do know how to make wise choices. Don’t be afraid to make decisions or choices; support yourself no matter what choice you make. The choices you make will rarely be life-threatening, so it may help to relax and take life less seriously. If you have a fear of being in a relationship because you believe that relationships end in painful separations, find examples of couples who have lived together in love and harmony for years. Look for evidence to support the belief that not all relationships are unhappy. Many couples have lived together their entire lives and still love and honor each other. Find evidence that not all relationships end in pain. Look for people who have gone through separations easily and amicably. Some people have not only survived separations, but are actually happier since their separations. If you have a fear of experiencing pain, you will create what you fear. Next, begin to act as if you are in a happy, fulfilling relationship. If you believe that finding a job is difficult and you doubt that anyone would hire you, remember a time when someone did hire you. Feel the same confidence and remember what you did when you were hired for that job. Gather evidence to support the idea that you are even more valuable now because you have more knowledge and experience than you did before. If you believe that your age is a detriment, remember that many of the world’s most accomplished men and women were in their later years when they completed their greatest work. If you were an employer, would you hire someone like you? If you would, then imagine someone else feeling the same way about you for the same reasons. If you wouldn’t hire someone like you, why not? What don’t you like about yourself? You have the ability and the power to change. You are in charge of creating yourself. Make sure that you focus predominantly on your positive qualities and the fact that you are a desirable employee. If you believe that you cannot create abundance in your life, look for evidence of those times when you have had money or other forms of abundance. You need to start somewhere, no matter how small or feeble your evidence may be. Look for evidence to prove the opposite belief, the belief that you have been able to create some wonderful things in your life so that you can begin to build a new confidence and with it a new experience. Then begin to act as if you have abundance. This may be as simple as spending a little more money when you would usually spend less. The law of manifestation works this way: Like attract like. If you radiate wealth and abundance, you will attract wealth and abundance. If you radiate love, you will attract more love. If you feel successful, happy, lovable, healthy, and wealthy, you attract these things to you. Whatever you send out will come back to you in like kind!